Do you experience difficulties seeing due to moving blotches, skewed or wavy distortions, or blurry, doubled, or washed out vision? Are you particularly light-sensitive and susceptible to headaches and sore eyes? These are symptoms of visual stress, a neurological condition that interferes with the processing of what our eyes see. Lighting conditions, glare, movement, and contrast can worsen these symptoms. For 15% of the population, hyperactivity in the brain’s visual cortex produces visual stress. This is often brought on by or found alongside conditions such as concussions, dyslexia, migraines, strokes, and epilepsy. Neurodevelopmental disorders such as Asperger’s syndrome, attention deficit hyperactivity disorder, and autism spectrum disorder are also common triggers. Fortunately, visual stress can be alleviated for many sufferers with the use of tinted lenses. At their visual stress clinic in Ottawa, Opticalm provides solutions to impede hyperexcitement and unwanted symptoms. 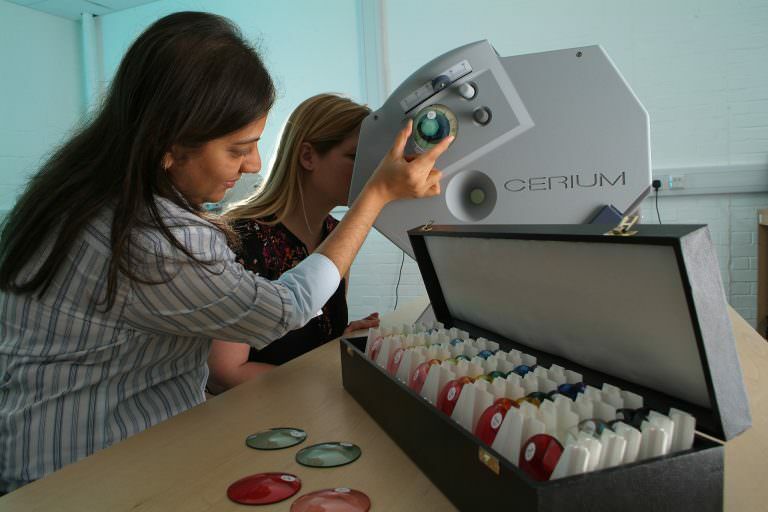 Colourimetry Specialists perform tests to determine each individual’s optimal filter colour. In a two year study of clients with concussions, 95% found relief through optimal colour accommodations. Klein Optical works with Opticalm to offer tinted prescription lenses to our patients experiencing visual stress. Opticalm’s lenses can be fit into any of our high quality eyewear frames or your existing frame. Find contact information for Opticalm below. Drop by or get in touch to find out more about this or Klein Optical’s other personalized vision solutions.